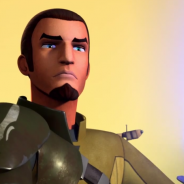 Kanan Jarrus, born Caleb Dume, was a Human male Jedi Padawan who survived Order 66. Going into hiding, he forsook the Jedi ways for sometime, swapping his blue-bladed lightsaber for a blaster. Eventually, he would come to command the VCX-100 light freighter Ghost several years before the Battle of Yavin. While cocky and often sarcastic, Jarrus was eager to help out and fight the Galactic Empire. Five years before the Battle of Yavin, Jarrus met Ezra Bridger, a fourteen-year-old Force-sensitive Human, whom he decided to mentor.